My Ph.D. thesis defense is in 2 weeks. Needless to say, this is pretty much the only thing occupying my mind these days. I've even been dreaming about my thesis at night. Like literally, dreaming about specific paragraphs in the actual document. Today I told one of my labmates about a recent dream, and he just looked at me for a minute and said "Maybe you need a break. Have you been cooking much lately?" And well, the truthful answer to that is no. Ever since I returned from Singapore & India last week (hopefully I'll be posting some recipes inspired by the trip at some point), I haven't had much time or energy to spare. But my friend is right. I do need to clear my mind. So today, I went for a nice run to take advantage of this ridiculously great weather, and then started thinking about dinner. I was in the mood for a hearty salad and I decided to try creating a new dressing inspired by this recipe on Eat, Live, Run. I started with the flavor profile in that recipe and made a dressing with tahini, white wine vinegar, sriracha, and a bit of yogurt. It was delicious. 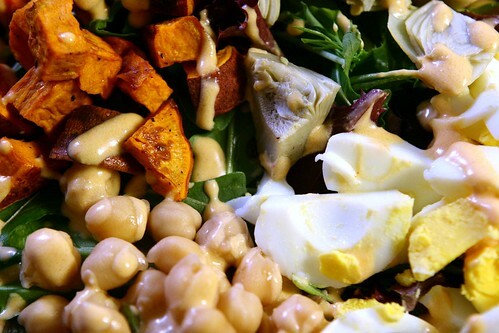 I used it to dress a nice big salad of spring mix topped with chickpeas, artichokes, hard boiled eggs, and roasted sweet potatoes. Substantial enough for dinner and very healthy - the perfect meal to fuel me up to dive back into that thesis tomorrow! What are your favorite ingredients for main dish salads? This dressing recipe makes enough for about 3 dinner-sized portions. Salad ingredient amounts and proportions can be adjusted to your taste. 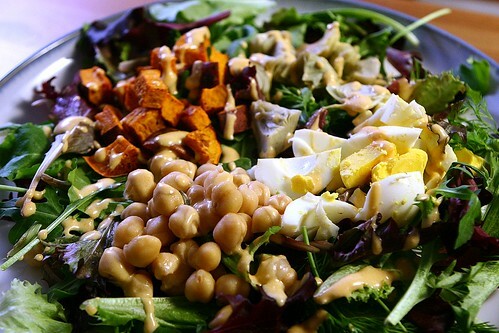 Put salad greens on a plate and top with artichoke hearts, chickpeas, eggs, and sweet potato cubes. In a small bowl, whisk together tahini, vinegar, sriracha, olive oil, yogurt, and water. Drizzle dressing over salad and serve. Great minds think alike with these salads on steroids today. This looks incredibly filling and satisfying. Here's to hoping these next weeks fly by -congrats!! haha, "salads on steroids" - I like that description! I've got to try this! I'm a sriracha addict. Looks like a lovely salad! I always like hard boiled eggs in salads, but I rarely think to make them.... Good luck getting your defense successfully finished! that sounds absolutely wonderful!! good luck at your defense, i know you'll do great :) it's totally anti-climatic, btw. Take the time you need to clear your head and cook so you don't stress out too much! I was just thinking last night how much I was craving tahini....perfect timing! This is so up my alley. I love tahini on salads. And good luck! Can't wait to hear more about Singapore too.